They come complete with the required Allen keys needed to mount and clamp the scope. 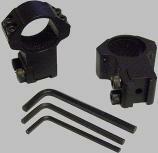 The Hawke Match Low mounts have a clearance height of 10mm between the scope and barrel. The Hawke Match High mounts have a clearance height of 21mm between the scope and barrel.